If you return the shoes/boots in NEW CONDITION within 30 days of purchase, you will receive a full credit on your refund or exchange. Returned items MUST be returned in their original box or a $10.00 fee will be applied when issuing your refund. Charges for expedited shipping, Alaska shipping, Hawaii shipping and APO/FPO shipping will not be refunded. We recommend trying on your shoes in a carpeted area to ensure there will be no wear on the sole in case of improper fit. 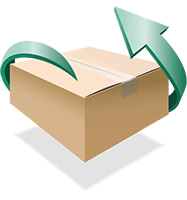 The customer is responsible for the cost of return shipping. No Returns On Accessories: Socks, KG's Boot Guard, Overshoes, Inserts and Insoles. All Waterproofing Issues Will Be Directed Back to the Manufacturer. If you need to exchange your shoes for a new style/size you will need to include a note indicating your new style's code #/size and either your original order number or the first and last name on the credit card that was used to make the purchase. All shoe & boot orders are eligible for the free exchange shipping label program (no accessories). The free shipping label is ONLY for customers who will be exchanging their original pair(s) for replacement items. You can receive one free return label per order. Shoes must be returned in new/resalable condition. You must exchange all the items you are returning or $15.00 will be deducted from any refund. You must request your label within 30 days of receiving the product(s). Credit for return shipping costs will not be refunded if customer fails to use our free exchange shipping program. *Offer valid only within the contiguous U.S. Defective shoes must be returned within 60 days of receiving your order. Please send us your note with the description of the defect. If a defect is confirmed, we will issue a refund or exchange your shoes for a new pair. Normal wear and tear of the shoe will not be considered to be a defect. All waterproofing issues and/or non-visible defects will be directed back to the manufacturer for inspection. Note: Customer is responsible for return shipping on all defective products. Only one new pair of shoes can be deemed defective per order. Additional defectives will be the responsibility of the purchaser. You should expect to receive your shoes within 4-8 business days (continental USA). APO or FPO 2 to 3 Weeks. Standard ground shipments within the continental United States are always FREE! Expedited shipping is available upon request for an additional charge. Call for details if you require expedited service. Shipping rates outside of the continental United States are listed below.